Rahm Emanuel has a half-baked plan to micromanage Chicago students' post-graduation life choices. Correction, April 5, 2017: It looks that Rahm Emanuel misdescribed his policy on air Wednesday morning. Around the time I started writing my post, Chicago Public Schools and Mayor Emanuel’s office sent out a press release explaining that, in fact, a current job offer or acceptance into a gap-year program would also count toward the graduation requirement. Moreover, a spokeswoman noted to me that City Colleges of Chicago—basically, the local community colleges—are all open admission, meaning everybody gets in. So the mayor’s new policy isn’t particularly restrictive, and as best I can tell it amounts to a rule saying that before you have to graduate, you at least need to fill out an application to a community college. The policy still seems like a largely pointless gesture that will, at best, lead a few more kids to take remedial classes. But I overdid it on the outrage earlier, based partly on a misunderstanding of the facts. I’ve left the original post in tact for posterity. Original post: Because variety is the spice of life, today Slate brings to your attention a bizarre public policy idea that did not originate in the bowels of Donald Trump’s Washington. Chicago Mayor Rahm Emanuel appeared on CBS News on Wednesday morning to announce his plan to create a new graduation requirement for the city’s public school students. In order to receive their diploma, 12th-graders would have to prove they had some sort of post-commencement life plan by obtaining an acceptance letter from either a community or four-year college, a trade program, or the armed services. 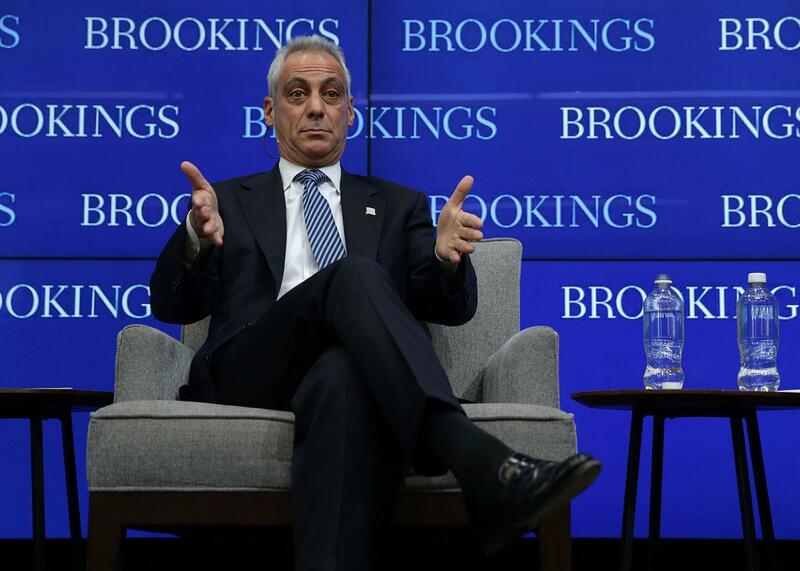 “We already have around 62 percent of our kids are already either accepted into college or accepted into community college, and our goal is to make sure nobody spikes the ball at 12th grade,” Emanuel said. “We want to make 14th grade universal. That’s the new goal line.” Chicago would apparently be the first city to try this scheme, which would begin with current freshmen. Emanuel says he cribbed the concept from charter schools. After blinking a few times in disbelief, my first reaction to this was to wonder: What about a job? Why is it only acceptable for students who aren’t college-bound to get vocational training as a plumber or electrician, rather than find work at a Verizon store or a restaurant kitchen or a day care center or a Starbucks? Why is getting a retail job not considered a perfectly responsible course of action for a young person who doesn’t feel ready for more school? In what world is earning a living considered “spiking the ball”? Why is Rahm Emanuel attempting to micromanage the life choices of 18-year-olds who may or may not even have been well-served by the city’s public school system? Then I blinked a few more times and wondered further: Why is this punitive? For young people growing up in poor, violent neighborhoods, merely graduating high school is often hard enough. Why give them one more hurdle? Emanuel says it’s about setting expectations. “Just like you do with your children, college, post-high school, that is what’s expected,” Emanuel said. “If you change expectations, it’s not hard for kids to adapt.” Sure. But you can set expectations with carrots rather than sticks. Give kids access to guidance counselors. Send them on tours of local colleges. Ask them to create five-year plans in ninth grade, if you must. Offer scholarships. Telling kids to get an acceptance letter or else mostly seems like it will just encourage students to apply to a community college without any intention of going. While we’re on the subject of college:What about the kids who can’t afford it? Emanuel notes that Chicago already promises free community college to every kid with a 3.0 GPA, which is lovely. But what about the kids with a 2.9? Why is their choice pay for school, become a carpenter, or join the Navy? And how about unintended consequences? As some people are already noting on Twitter, a plan like this seems like an obvious marketing bonanza for predatory, for-profit colleges. It also seems like a good way to funnel underprepared students to community colleges they may simply drop out of. I think Emanuel has basically good intentions here, and to his credit, there is evidence that the sort of disciplinarian, “no-excuses” charter schools he seems to be taking inspiration from really do get more students to enroll in college. But that doesn’t mean it makes sense to dictate life choices to an entire city of high-schoolers. Hopefully this plan never becomes more than a TV sound bite.